Spring is the perfect time of year to get outside again and enjoy the beautiful warm weather. Most home owners will use this time to create the ideal outdoor space for their family and try to show up the neighbors with the latest and greatest gadgets. Even though it seems like there is only so much you can do to create a great outdoor space, many people forget about how much can be done to the deck alone. The deck addition not only adds value to the home, but can also create the perfect outdoor space for everyone in the family. Here are the top improvements for the deck this spring. There are a lot of fancy new tech tools that people can use to make their deck the ideal space to be at this spring and summer. Home owners can find the gadget that works best for their needs and will impress everyone who walks onto the deck. Some people may want to use deals with SatellitePackages.net service to get the big game on a big screen TV, and others might want a remote-controlled cooler to serve drinks and snacks to everyone. Most decks will take on a lot of wear and tear over the winter season. Home owners should give the wood or other materials a little TLC to make sure it looks as new as possible and can withstand the damage of another spring and summer season. Power washing, staining and painting might be all the work it needs to look new again. Storage on the deck is usually pretty scarce, or even non-existent. Home owners can add on a little storage to make the space more usable and functional in the backyard. Some storage options can include hollowed out benches or hooks on the side of the home. Some people are lucky enough to have a deck that overlooks a scenic view. These people may love to sit on their deck and enjoy the view, but are often frustrated about the railing that blocks it. These people can try replacing their railing with cable railings to have a less-obstructed view of their scenery. The sun may not be a problem yet, but in the middle of summer, most people are wishing they had just a little bit of shade to enjoy to shield them from the hot sun. Adding a retractable shade to a deck is more inexpensive than ever and most home owners can install it easily themselves. If this is not an option, try a table umbrella or even planting a new tree in the yard. 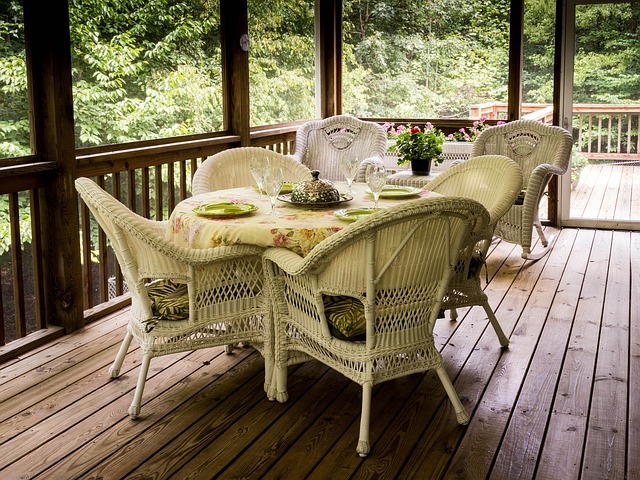 Comfort should be a word that everyone associates with their deck. Comfortable seating is not always easy to find, but it is always worth every penny. Home owners can search for the perfect finds of create their own comfort by bringing out pillows.